An advanced marching snare drum carrier offering mounting free of J-bars and offering lasting comfort. 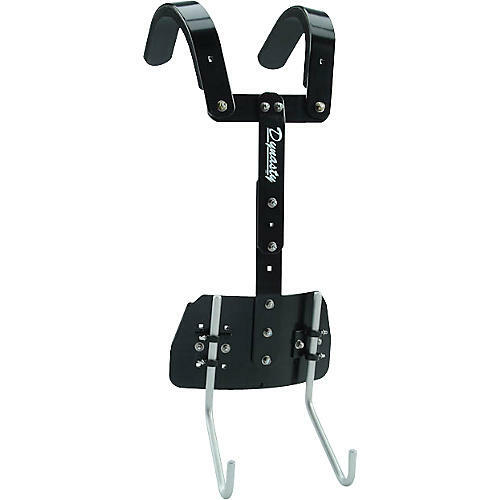 The Dynasty T-Max SEM mount carrier combines durability with the comfort today's marching percussionists demand. The Dynasty SEM (Single Entry Mount) system alleviates the need for traditional J-bars, allowing for easy mounting and long-term comfort. This carrier's unique design places the majority of the weight on the hips, taking pressure off the player's neck and the shoulders. The T-Max SEM mount carrier also features a unique track system enabling the player to adjust the height of the drum easily. All of the padding on the carrier is equipped with Velcro, facilitating adjustments and replacement.